The world’s smallest and lightest portable oxygen concentrator. Small enough to fit in the palm of your hand or pocket, and weighs less than a mug of tea...This breakthrough in portable oxygen technology weighs 0.8kg and is 6.5 inches long. It supplies 2lpm on a pulse-on-demand setting, and can supply between 3 to 6.5 hours’ oxygen with its standard battery supply. This time can be increased with extra batteries. 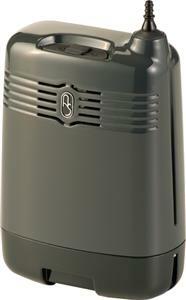 The Airsep Focus is the lightest portable oxygen concentrator to be released by Airsep Corporation. Designed to be more convenient and practical, this lightweight innovation has superior technology, allowing it to provide medical grade oxygen at a 2lpm flow-rate at a fraction of the size of its competitors. The Airsep Freestyle Battery Belt will work with the Airsep Focus if you have the adapter.